Just got a few little questions that have been bugging me all week. I hope you'll excuse my noobness at medieval history. :9 I've been a lurker here for a while and I thought you people could shed some light on this. I've heard some people say that seeing ordinary civilians walk down the street with a sword in hand was a common sight. However, someone else (Not on this forum) said that the ordinary civilian, a peasant, would be much too poor to afford a sword. When I offered the suggestion that they may have been looted from battlefields, he said that while they could loot, the loot was given to the nobility and not for the serfs to keep - the serfs were on war with minimal pay and minimal weapons. And even if a commoner were to come across one, he wold probably have sold it, and he insisted that the common man in medieval europe could not afford a sword and were restricted to crude farming tools as weapons, even if they were at war. So was a commoner wealthy enough to own swords? How would they have procured it? It'll be good if someone can give a rough summary of how a medieval town worked. And this brings me to my next question: How was the army for a war gathered up? Were they issued weapons and armor? Was their pay decent, or minimal like the other guy said? I've read somewhere (can't really remember accurately though) that it was the responsibility of the nobility to gather up a certain amount of men, weapons and armor to add on to an army, but I don't know how true this was. I know it's a lot of questions for one post (And my first one at that), but I'm nothing but a mess of questions. It would help tremendously if you where to narrow down the context of the question to a specific time and place. What is true for 13th century Scandinavia will be very much different from 16th century Italy or Russia and so on. Even seemingly simple concepts like"civilan", "peasant" and what constitutes a "town" will not be consistent over time and place and changes a lot during the medieval era. Unless we can narrow down the scope, any answers will be vague and anecdotal at the best. Generally, the medevial military system was based on each subject buying weapons and equipment in acordance to his wealth. Exactly what you should own would, of course, vary with place and time as well. In addition to this, a king could give land to vasals in exchange for a certain military or monetary contribution. 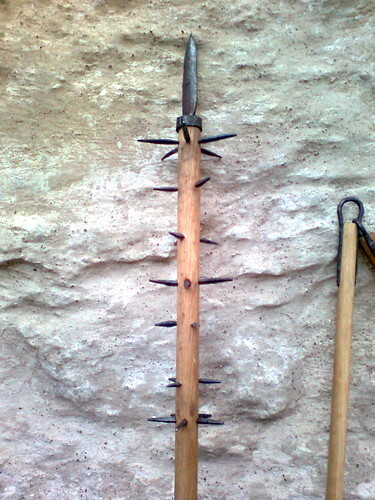 This provided a core of professional, well equiped feudal troops. In some countries, like France, the armies consisted almost entirely of feudal troops (simply because the country was large enough) while other countries, like England, fleshed out their armies with leavied troops (mostly archers, because leavies where not considered suited for hand to hand with the pros). Others again had so few feudal troops that they fielded the leavies as the main force, like the Scots during the first Scottish War of Independence. In the later case, the leavies actually fared well against the English feudal force, due to the effort put into their training and deployment, causing the English to replicate their Digg-in-and-hold-with-infantry tactics when similarly out-knighted in France, though they had sufficient feudal troops to have them do the hand to hand figthing. By the high middle ages, a sword would be as expensive in comparative terms as a modern firearm. Terms like "ordinary civilian", "peasant" and "commoner" are very vauge and can have very diffrent meanings depending on the time and place. For example everyone outside the noble & clerical classes was a "commoner" regardless of wether the man in question was a prosperous yeoman, a serf or a professional soldier. Diffrent nations would have diffrent laws and rules concerning the ownership of arms. In Sweden for example owning arms & armour was mandatory for every free man over the age of 18. The various provincial laws laid down the arms to be owned in greater or lesser detail. Bow, sword or axe, shield, helmet, mail. Bow, spear, sword, shield, helmet, mail or coat of plates. Sword, shield, helmet and coat of plates. And all other that may, shall have Bows and Arrows out of the Forest, and in the Forest Bows and Boults. Many cities in Flanders, Germany and Italy to name a few places could field large and well armed urban militias thanks to similar laws. Swords came in wide variety of qualities and prices and were by no means too expensive for many of the "common men". These would be bought at markets or from a maker/merchant towns/cities were those were active. A list of the swords produced by Master Markus Dieffstädter in a single year included 150 'peasant's swords' next to the military swords, rapiers and daggers made in his workshop. Walking down the street sword in hand would be a sure way to attract the attention of the local authorities. Swords and heavier weapons were not a part of everyday dress even for the nobility. Knives and daggers were the most common 'weapons' worn as part of everyday dress. How an army was raised aand equiped depended even more on 'where' and 'when'. The medieval period saw a huge number of variation on this subject. There was no such thing as a 'standard' medieval army. I'll get back to you with a few examples in a later post. We can only consider this at the regional level. Regionally they had laws dictated the color of the cloths that you wore because it was part of their way of identifying what class you belonged to. Carrying a sword was another identifier. This is part of the reason why the sword has developed the high esteem it has. In an age before ID cards, what you looked like told people who you were. In the medieval ages the structure of society was considered to come from God. To dress and wear arms beyond you class status was to challenge to social structure and Gods will. Big no-no, with very painful consequences. People were conditioned in such a way from birth that it would be a big mental leap to think of doing something beyond their social bounds. It's also important to remember that in some times and places, looting rights were a powerful motivator to get people to fight in your army. So you can't make a blanket statement that all loot went to the nobles. While that would be true for a particular time and place, it would not be true elsewhere. At least in England by the 13th it seems the sword was fairly common. By the 14th and 15th you see them being owned by all sorts of people in various social classes. All in all I'd say generally speaking your buddy is off base. I think more places would see this being common for commoners by the 12th or 13th than the opposite. Something to keep in mind is that just like everything you have a wide price range on swords in the late medieval period. I tend to avoid the idea that commoners could not wear or own something because their status and perhaps offending some noble. Over the last decade of reading medieval english legal accounts it really is not a common event... I can think of only a handful that might be examples over the last two centuries. In 14th and 15th century English looting contracts the commoners most certainly could loot whatever they pleased as long as the proper division of total wealth was accomplished, usually 1/3 to the king, 1/3 to the captain and 1/3 to himself. I can't add much to what already has been said but one thing to consider is what is meant by a sword. Finely made double edged swords were expensive and were made by skilled specialists. 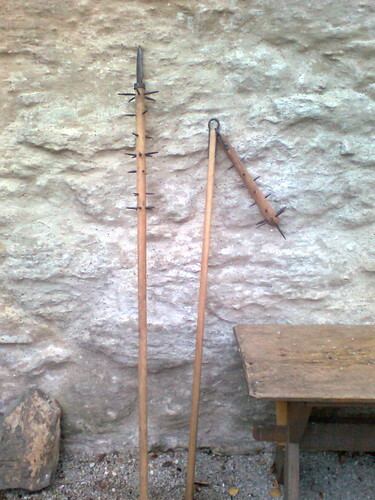 However there were single edged weapons, such as the falcion and the langseax, that could easily be made by a local smith. Also some "knives" had blades almost as long as some swords. Owning and carrying a sword, or sword like weapon, are two different things. The noble and knightly class were often responsible for enforcing the law and may have been required to go about armed. Likewise "common" men might be expected to periodically serve in a standing watch during which time they would be expected to be armed as well as there were the non-noble, non-knightly men who served as full time soldiers. Again, as stated repeatedly above, this all was very dependant on time and place. I Again, as stated repeatedly above, this all was very dependent on time and place. There is also law(s) and local custom: It might not be illegal but it might still be looked upon as strange to carry/wear a sword in some cities in some period or places. A bit like walking around with a shouldered hunting rifle in a jurisdiction where it's not against the law but would be seen as inappropriate and would attack unwanted attention from the authorities. ( Big city, no, rural town during hunting season, yes ! ). In other places in the world carrying around an AK 47 or an Uzie while doing one's food shopping at the market doesn't even rate a second look and in other places owning a firearm legally is impossible. So In period one might own a sword but only carry it around when traveling or during an emergency and only wear a large dagger the rest of the time. Late Medieval and Renaissance wearing a sword or rapier became popular for both self-defense and as a fashion statement. In some cities of the medieval period daggers where limited to 12" blades or so as everyday carry but if one had a credible reason carrying a sword as packed baggage to be taken out and worn outside the city limits would be legal I assume and nobles being considered as " the " military force they and their guards or body guards would probably do pretty much anything they wanted in their own city at the very least. ( Again fashion and local custom might influence how heavily armed one would typically be in everyday like: One would not walk around with a spear or in full armour but one might wear a hidden maille shirt under street clothes and carry a dagger were assassination was a possibility or robbers where common at night ). Excellent thread! This makes for the most interesting reading, very well thought out and presented answers. It should be mentioned that within the medieval German system of martial arts there is a LOT of material on fighting with the Gross Messer, or Big Knife. This is essentialy a peasant's utility knife, similar in size to a machette. But some would consider it a sword. The Messer must have been very effective in combat if the nobility of the time learned how to fight with it. 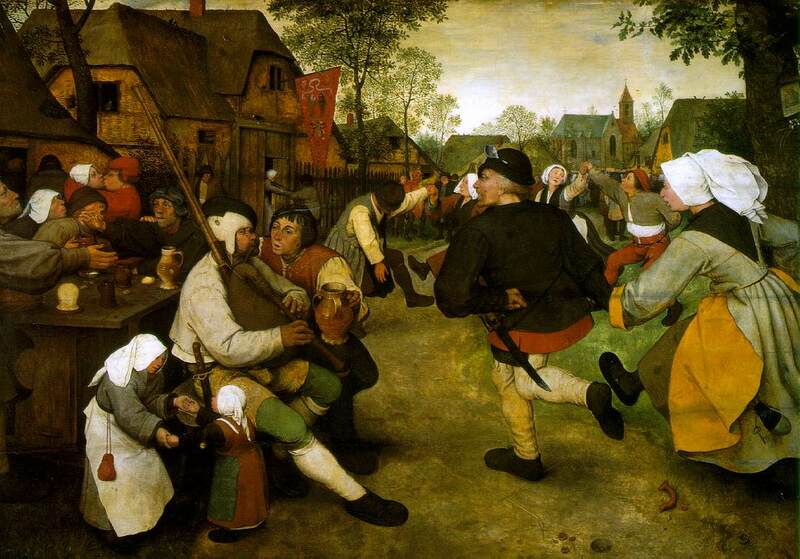 Just check out some of these 'tools' illustrated by Pieter Bruegel. There were also societies from the early middle ages or Iron Age in which it was customary for a free man to carry a spear. Saxon England apparently had "spear control" laws: If a someone is wounded by your spear while the point was at head height or above, it's his fault, but if the point was below head height, it's your fault. Pretty sensible! Wow guys, that's some really great answers there! Lots of very well thought out and well presented information. I understand that the question is a little too vague... I had actually thought, foolishly, that there can be "standard generalities" for the Medieval Europe social system. Hmm, it's difficult to decide on a specific time because the scope of my interest is actually pretty wide, partially because I have very little, and rather disjointed knowledge on the subject... And my local library isn't much help because such books are usually borrowed out because they are few and far between... You could say that I'm just trying to gain as much knowledge as possible (because I know so little it hurts ). But mostly, I'm interested in 12-15th century Italy, Germany, France and England, and lots of questions for England were answered there (Great link, Daniel!). So in what period was it not weird to carry a sword (or sword-like weapon) around, and in which country if not in England? And what were the social classes and their "boundaries"? I thought that "ordinary civilian" was a blanket statement for anyone who weren't as penniless as peasants (<-- Note: I'm pretty sure I read somewhere that even within peasants there is sort of a descending "scale of richness") but weren't as rich as nobles, but it seems that there was much more to it than that. I'm looking forward to see what you'd post. Again, it depends a great deal. Let's take the Netherlands, with which I'm (logically) most familiar. The Netherlands was in the middle ages an integral part of the German Empire, so you can think of it as answering your question for a part of Germany. Other areas within Germany had positions similar to areas within the modern-day Netherlands. Even within a relatively small area like the Netherlands, you had a lot of variance between the regions. For instance, the 12th C. county Holland was a traditional feudal society, whereas the county Friesland was a "farmer's republic" where local landowners (rich farmers with some followers) were often at war with their neighbours and even with the surrounding counties / duchies, like Holland and Gelre. Likewise, in the 12th C. Friesland, "commoners*" owning weapons would have been extremely common, whereas in 12th C. Holland it would have been less likely (but probably not unheard of). In Holland in the 15th C., the nobles lost a lot of power to the cities which were at that time well established. In cities, the commoners held the power, and were thus equipping their own militias. Also, commoners were generally much more wealthy in that period and therefore more likely to own high-quality arms and armour. Then if you add complex organisations like the Hanseatic League, which fielded it's own military units while some of it's member cities officially still belonged to some local county, you can imagine that the situation gets confusing. Nevertheless, the bottom line from period artwork seems to be that in 15th C. Germany, including the Netherlands, nearly all men regardless of birth carried some kind of weapon, be it sword or messer. * Note: I use the word "commoner" for people who were not of noble birth. However, the differences between commoners were huge. Wealthy farmers and merchants may have had more money and power than some local noblemen. And if that was the case, then yes, they would own and carry weapons if needed. It really depends on the period one is referencing. There were freemen who were not serfs who lived in villages and tended their own land as well as serfs who were more or less tied to the Lord of the manor. All were subject to the levy. In the later medieval period villages developed into prosperous towns with merchants and craftsmmen who could afford swords. They could also afford to buy their way out of the levy with scuttage or shield money so why invest in a sword except for personal protection.. However, the serfs and the freemen of the early medeival period were sort of a "come as you are" sort infantry and not considered to do much other than just show up and give numbers to the army. As for them they just wanted to get back to their fields alive and in one piece. They couldn't afford weaponry so brought what they had...axes, flails, hedging tools knives and maybe had some spears provided by the Lord from his armory. They were used to protect the archers from cavalry attack. They also were shown no mercy by knights or men at arms since they could not be ransomed. Also they were not considered suitable targets for attack as were other knights for the glory, weapons, horse, and rewards from the Lord as well as a ransom if the Knight were taken alive. Frankly, I find that the axe, flail, and hedging bill were very suitable weapons highly adaptable to warfare expecially in a melee when a heavy charge broke through the infantry. The infantry armed with spears were extremely important in keeping the heavy cavalry at bay and even served to protect the heavy cavalry of their own side at times. As such they targets for the archers on the opposing side who sought to shower them with arrows to break up their formations or at least weaken them preparatory to the heavy cavalry charge. We discovered that the spikes most likely will be lost in a battle but that's really more the concern of the poor bugger getting hit with these weapons. 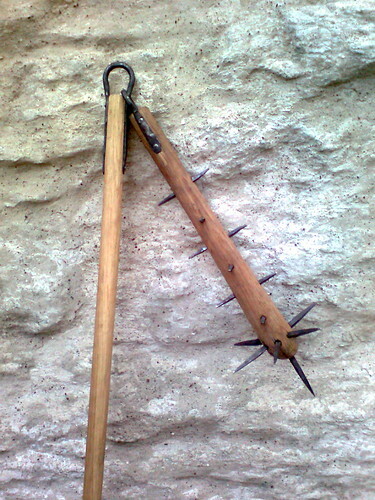 And the flail in very effective on it's own even without the spikes. We've used several 15th century sources as base for these weapons and the simplicity of them suggests that when needed, quite a lot of arms could be raised in very short time. They might not be long lasting but on the other hand how many times were a commoner in battle in general? They do serve the porpose and are easily replaced. Unfortunately We don't have pictures of the billhook we converted to a polearm but if i remember I'll post i later. I'm currently working on mounting a scythe on a ling shaft for use as a polearm and most likely I wont take pictures until it's done anyways, ha ha. Eric, those weapons are awesome - the one on the left are based on a Dalecarlian war club from the peasant rebellion of 1743 I reckon? Mikael, we didn't use any exact references. 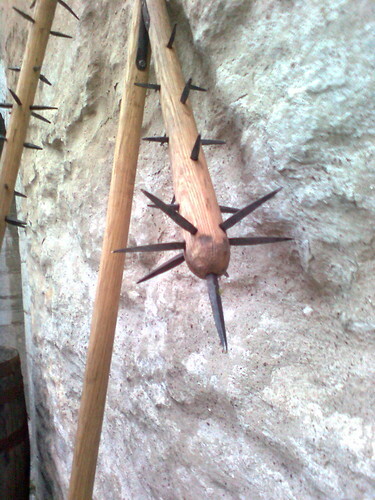 Since there are quite numerous spiked clubs around we just made one that has the right "feeling" of a medieval one. But it's always fun if there are more references to compare with. The long spikes on the flail are quite uncommon but I found them on a 15th century illustration and found it to be an interesting detail. As stated before, these are very simple weapons to make and the blacksmithing knowledge required is minimal. Now I feel eager to start up the forge someday soon and finish the rest of the weapons!